Vice-Chancellor, Professor Edward Peck and NTU representatives meet with NTU partners in Beijing, Xiamen and Hong Kong to establish new academic relationships. At the start of December 2018, Vice-Chancellor, Professor Edward Peck and NTU representatives visited Beijing, Xiamen and Hong Kong to meet with existing partners, establish new academic relationships and engage the NTU alumni community. 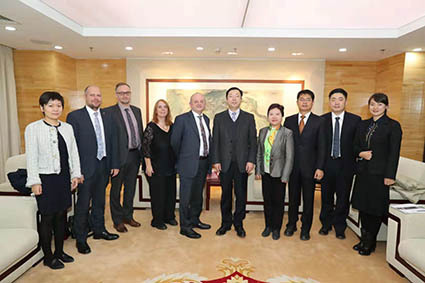 In Beijing, the NTU representatives visited two of NTU’s most important Chinese partners, Communication University of China (CUC) and Beijing Language & Culture University (BLCU), both of whom had appointed new Presidents since Professor Peck’s last visit to Beijing. At CUC, the two Presidents agreed to expand collaboration beyond NTU’s Joint Education Institute with CUC’s Faculty of International Media (ICUC) to encompass a broader and deeper partnership including joint research, conferences and staff exchange. ICUC currently offers three joint Master’s programmes in MA Broadcast Journalism, MA Media and Globalisation and MA Museum and Heritage Management enrolling 89 students per year. The Deans of the Schools of Art & Design and Arts and Humanities continued their ongoing dialogue with ICUC on how our Joint Institute might expand to include new subject areas and joint undergraduate programmes. At Beijing Language & Culture University (BLCU), Professor Peck and BLCU President, Professor LIU Li, signed a renewal of NTU’s long-standing student exchange agreement in Arts and Humanities. They also received an update from BLCU’s Business School on productive talks that had taken place the previous day on future cooperation. Professor Peck also thanked Professor LIU Li for continuing to host 10 NTU students a year on its Chinese Language and Culture Immersion Programme. These students are recipients of the NTU Vice-Chancellor’s Mandarin Scholarships which cover the costs of attending the 4-week programme in Beijing. After Beijing, the Vice-Chancellor’s delegation travelled south to the coastal city of Xiamen to visit Xiamen University. The University is one of the most prestigious in China with a very strong research profile. It has also been voted as having the most beautiful campus in the whole of China. Xiamen University President, Professor ZHANG Rong welcomed Professor Peck and gave his full support to developing research collaboration and student exchange between Xiamen University and NTU. He also gave his support to NTU strengthening its existing collaboration with Xiamen University’s affiliated independent college, Tan Kah Kee College, by creating new articulation and progression pathways into NTU. The visit then ended in Hong Kong, where the delegation visited one of NTU’s longest standing international partners, Hong Kong Design Institute (HKDI). HKDI has run two NTU top courses, BA (Hons) International Fashion Business and BA (Hons) Fashion Design, for 12 years with 50 students studying on each course. The same evening, Professor Peck hosted a reception for NTU’s Hong Kong-based alumni, updating the 60 enthusiastic alumni present on NTU’s latest achievements and inviting them to sign up to the Alumni Fellowship Programme.